Is your dishwasher’s tray not working? Is it not gliding in and out smoothly? It could possibly be because of a broken or damaged wheel support. 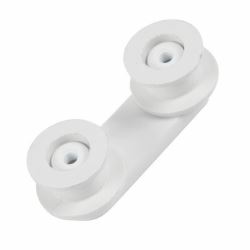 Great wheels for top dishwasher tray and half the price of the OEM's ones. Easy to fit, perfect replacements for my DWS919 upper basket. good as new now. One of 3 items I purchased to solve sticking baskets. Simple to fit (just push into place) and now the baskets move with ease. Very good service. Recieved the item in the delivery time stated and it was cheapest I could find on line. Very easy to fit made my dishwasher like new wish id done it two years ago instead of messing about. Thanks RANSOMESPEARS. Easy to replace. Good quality. Replica for 15 year old dish washer.